For this post I decided to play around with some Gellux gel polish (by Salon System). I don't have any nails of my own anymore - they are so short. I didn't actually wear these press-ons! All gel and all done with a striping brush. I sculpted these with gel and then embedded some lace. I added a few dots with acrylic paint to make accentuate the design. Tonight I want to show you a manicure that I have been wearing, without a chip, since Sunday. 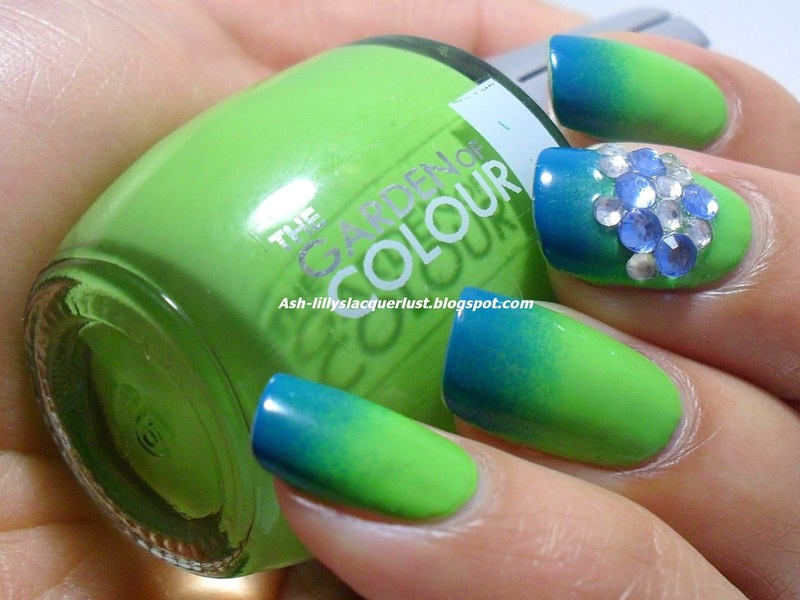 This is 'Sour Apple' by The Garden of Colour from Viva La Nails. For the blue tips, I used Face it's BL607 - a polish sent to me by Anastacia some time last year. 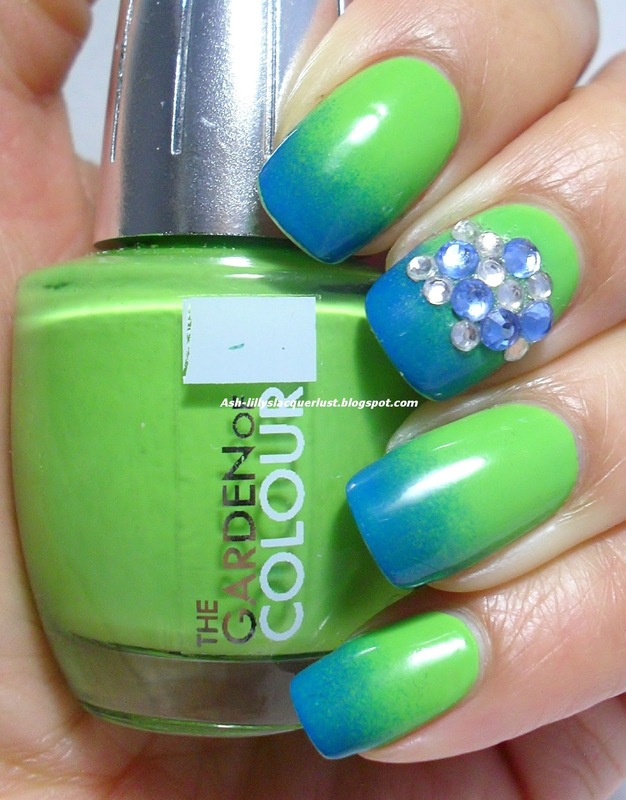 I really like this green! The crystals are from eBay and they were stuck on with only nail polish. I rarely wear French manicures. Come to think of it, I'm not even sure if I've ever posted one on my blog. I wore them constantly when I had talons (natural) back in the 90's...cor, that makes me sound really old. My nails are actually incredibly short at the moment. You wouldn't believe it, but my index finger nail is about 1mm long. I have high hyponychiums (that piece of skin on the underside of the nail where it's actually attached to your finger), so my nails look longer than they are. The French manicure also gives the illusion of length, but I find it incredibly boring...hence why I HAD to jazz it up! 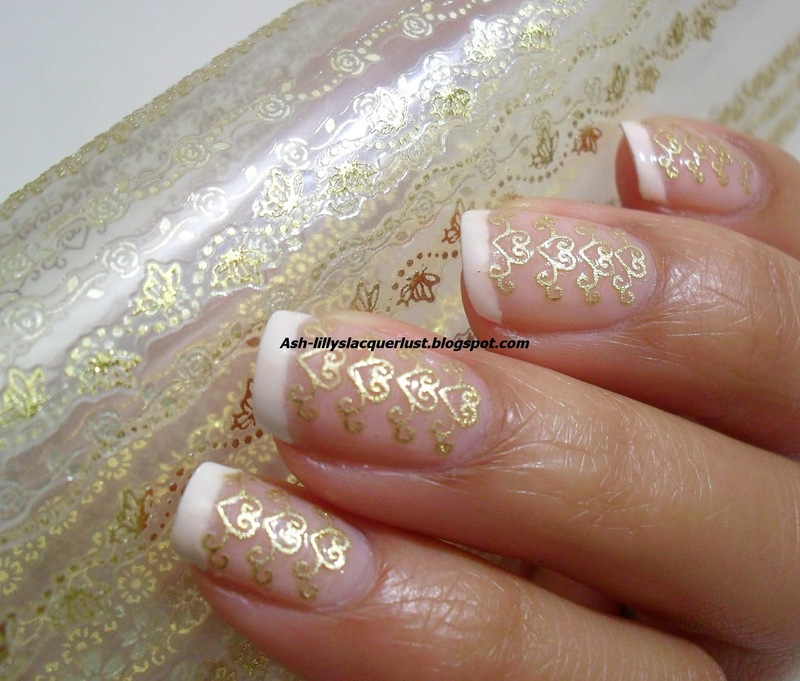 For this look, I used these Gold Lace Stickers from Born Pretty Store. The stickers come in long strips which have an adhesive on the back, so you can cut as much or as little as you want and stick it to the nail. I used two layers of top coat to seal these on because I was worried about them lifting at the edge. I needn't have worried - they were really hard to remove. I used pure acetone to remove the polish, but the stickers were stuck tight. Unfortunately I had to scrape at the stickers to get them off my nail in the end. So there you have it. Some really easy Valentine's day looks. I couldn't go with some crazy pink design this year - I have several important meetings tomorrow and a bunch of hearts and glitter wouldn't really have been appropriate! Whatever you do tomorrow, have a lovely day and thanks for reading! 'Tis the night before Valentines, people! I don't know how you feel about the day, but I'm neither here nor there. My wedding anniversary is at the beginning of March, so my husband and I always place more emphasis on that day. 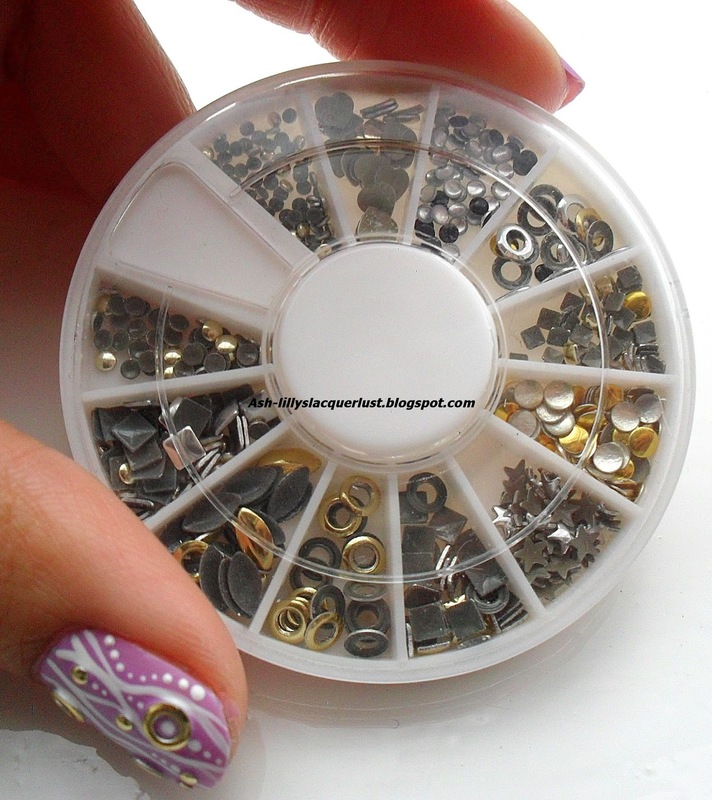 I am totally in love with these nail studs. In particular, the cut-out circles are my favourite and after searching high and low, I was stoked to see that they were available at Born pretty store. 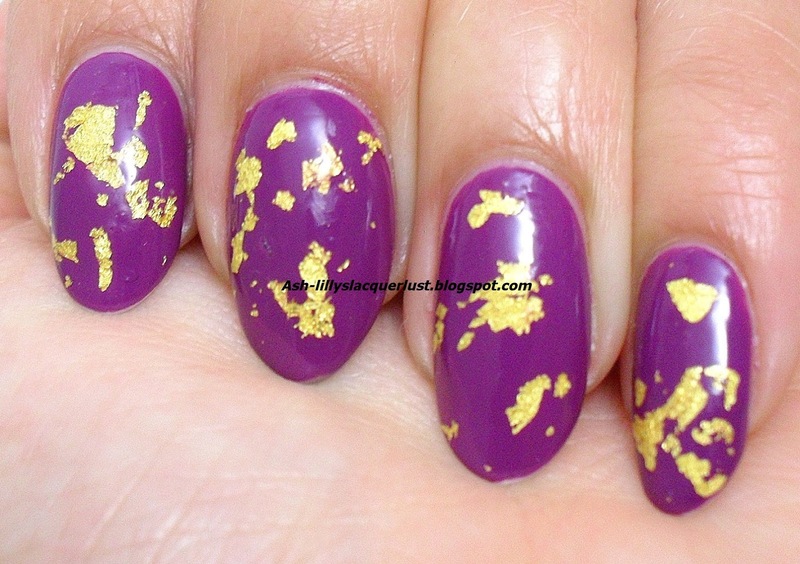 I used the gold coloured, cut-out circles and gold mini studs to create this manicure. I stuck them into the polish when it was tacky and the designs were created with white acrylic paint. When it came to removing the studs, I was pleasantly surprised to see that the acetone had no effect on the colour; they didn't tarnish at all. They were in such a good condition that I actually kept them to use them again! Here is me posing with my iphone case from a pound shop! I may be a bit tardy to the party, but this is my first time wearing gold leaf nail polish. 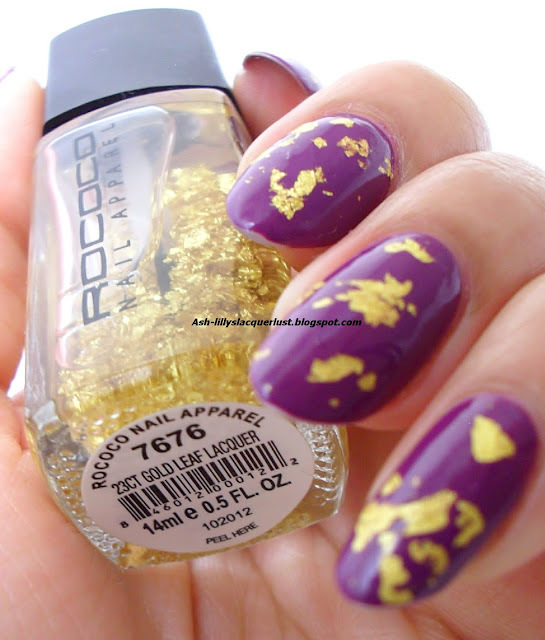 'Purple Reign' and '23ct Gold Leaf Lacquer', available at Space NK You'll notice that the gold leaf has sunk to the bottom of the bottle - I'm pretty sure that this is not supposed to happen. I've just now had another look at the site and can see that my bottle of polish looks like it's missing 50% of the flakes. Excuse the tip wear. This polish was on for three days! The gold leaf pieces are quite large (brilliant), but they wouldn't stay suspended in the lacquer base (not so brilliant). The clear base was very thin, so trying to apply the flakes took some time. They would not come out of the bottle and I had to chase them around the bottle to scoop them out. Even after giving the bottle a good shake, I still had to fish for the flakes. If I simply dipped the brush into the bottle, the only thing that would come out was clear polish. 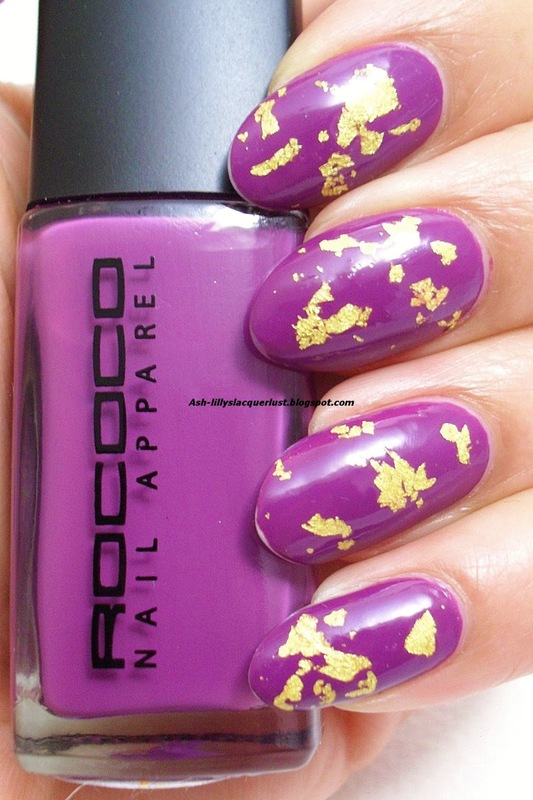 Having tried Rococo polishes for the first time, I was really impressed with the 'Purple Reign'. It had great coverage and was beautifully pigmented. The '23ct Gold Leaf' Lacquer', however, was a bit disappointing because it was a chore to apply. I was able to enjoy this for three days without a chip, so I guess the positives outweighed the negatives in the end. 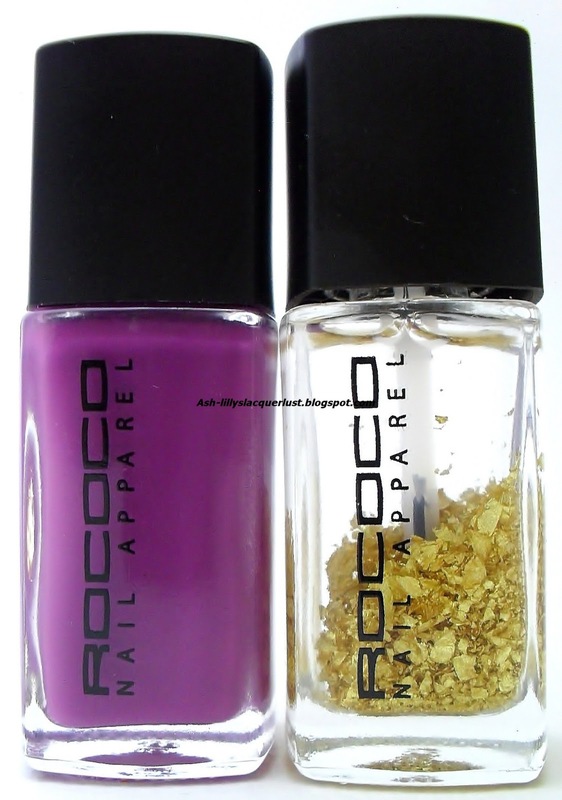 Have you tried any of the pigmented Rococo Nail Apparel polishes before? If you've kept up with my blog over the last two years, you will know that I am a lover of water decals and nail stickers. Not only are they a way to instantly jazz up a plain manicure, they are also quick and easy to use when you are in a hurry. 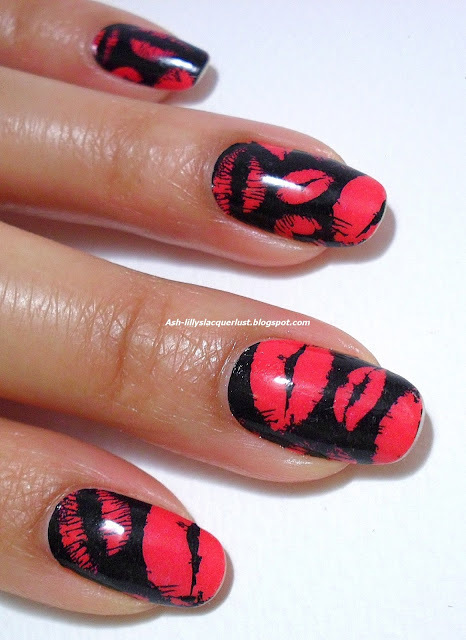 These nail polish strips by *OMGNailStrips are right up my alley. 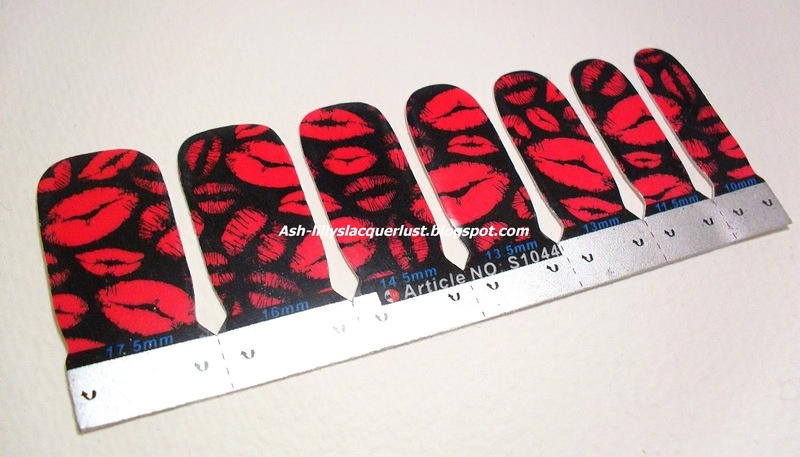 In one packet, you'll get two sheets of pre-cut nail stickers. 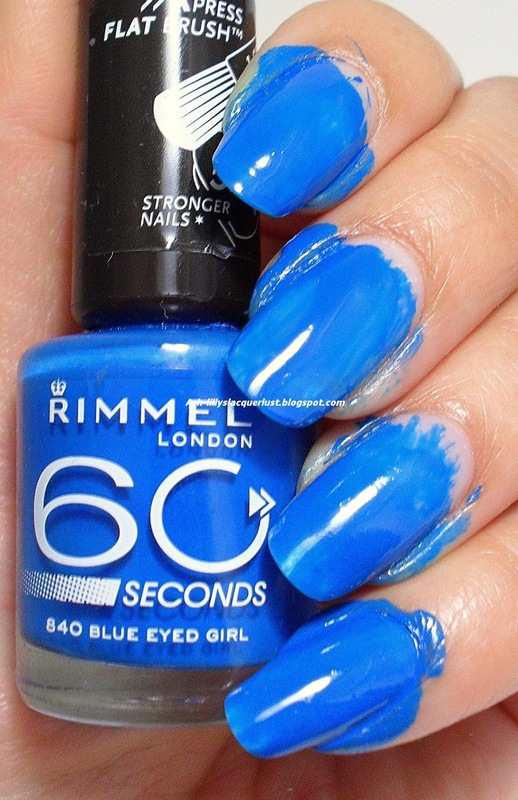 They are so simple to use: just size the strips up on your own nails, remove the clear plastic covering on top of the pattern, peel the design off the cardboard backing paper and stick them onto your nails. 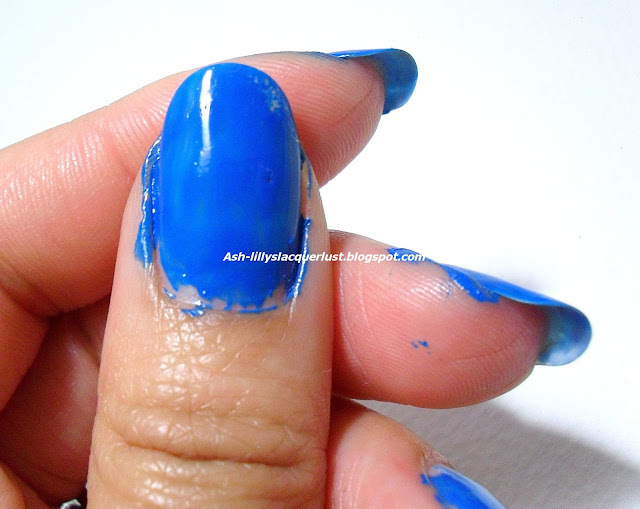 You can stretch them (which is good if you have a high apex, or curve, to your nails) and they won't tear. 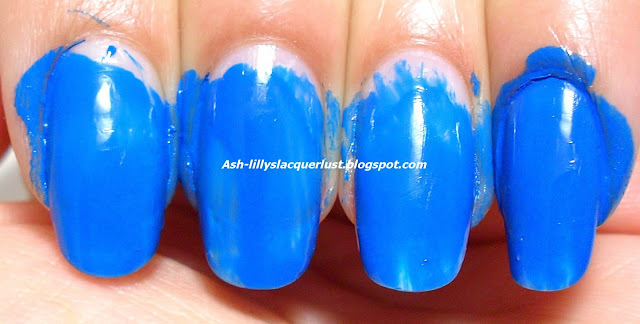 The OMGNailStrips after one day of wear. There is some tip wear, but I'm not known for wearing washing up gloves and I had washed three heads of hair with these on. Have you worn these strips before? What do you think?